CONTEXT: This retrospective study was planned to ascertain the relative frequency of odontogenic tumors (OTs) in an Indian population in the light of the latest World Health Organization (WHO) classification. AIM: To compare data with various reports from other parts of the world. STUDY DESIGN: Retrospective study. MATERIALS AND METHODS: The histopathology records and archived slides of all lesions diagnosed as “OT” in the Department of Oral Pathology and Microbiology of Government Dental teaching institute, Mumbai, Maharashtra, India, were recovered from the period January 1981–December 2016. A total of 250 lesions thus classified were reviewed for age, gender, site of tumor, and histopathologic typing. The tumors were reclassified according to the WHO 2017 criteria. STATISTICAL ANALYSIS: Microsoft Excel 2010 was used for statistical analysis. RESULTS: In all, 250 cases of OTs were reported in a 35-year period. OTs in this study constituted 7.14% of all the 6797 registered biopsies. The most frequent histological type was ameloblastoma (AML) (30.8%), followed by odontoma (19.2%), unicystic ameloblastoma (18.4%), adenomatoid OT (14%), cementifying fibroma (6%), odontogenic myxoma and cementoblastoma (2.4% each), calcifying epithelial OT and odontogenic fibroma (2% each), ameloblastic fibroma (1.2%), squamous OT, dentinogenic ghost cell tumor, peripheral ameloblastoma, ameloblastic carcinoma and ameloblastic fibrosarcoma (odontogenic sarcoma) (0.4% each). CONCLUSION: A frequency of 7.14% of OTs was observed in this study. AML comprised the single most common tumor of all OTs. This study observed geographic variations in the frequency and distribution of OTs. Odontogenic tumors (OT) are heterogeneous lesions derived from epithelial or ectomesenchymal tissues or both. They range from hamartomatous or non-neoplastic tissue proliferations to malignant neoplasms with metastatic capacity. In humans, tumors of the odontogenic tissues are comparatively rare, comprising about 1% of all oral and maxillofacial biopsy specimens diagnosed. Various retrospective studies from Africa, Asia, Europe, and America have shown that differences exist in the relative frequency of the various histologic types. The World Health Organization (WHO) published the classification of OTs in 1971, with revisions in 1992 and 2005. In the 1992 classification, calcifying odontogenic cyst was introduced as an OT. In the 2005 WHO classification, odontogenic keratocyst (OKC) was reclassified as keratocystic odontogenic tumor (KCOT). This then increased the frequency and distribution of OTs. The fourth edition of the WHO classification of head and neck tumors was published in January 2017 and like the earlier editions  mainly divides OTs into two categories of benign and malignant, based on biologic behavior. While the 2005 classification organized benign OTs into “Odontogenic epithelium with mature, fibrous stroma without odontogenic ectomesenchyme,” “Odontogenic epithelium with odontogenic ectomesenchyme, with or without hard tissue formation,” and “Mesenchyme and/or odontogenic ectomesenchyme with or without odontogenic epithelium,” the 2017 edition includes a simpler format such as epithelial, mesenchymal (ectomesenchymal), and mixed OTs. The complex and detailed malignant OT classification of the 2005 edition was also made simpler by this new classification. The malignant tumor section includes numerous updates from the 2005 edition, including simple reclassification of ameloblastic carcinoma (AC) and primary intraosseous carcinoma; the addition of a new entity of sclerosing odontogenic carcinoma; reconstituting entities carcinosarcoma and odontogenic sarcomas (OSs) without subclassification; and excluding metastasizing ameloblastoma (AML) because of its bland histologic features. The most notable change in the benign tumor group is that the keratocystic OTs of 2005 are now classified under developmental odontogenic cysts as OKCs. The 2017 classification has narrowed AML to conventional, unicystic, extraosseous/peripheral, and metastasizing types. Some major changes were also made in the classification scheme for this tumor group. Although odontoameloblastomas and calcifying cystic OTs were excluded from the mixed odontogenic classification, the new entity of primordial OT was included for the first time in the 2017 classification. There were no major changes for mesenchymal OTs in the fourth edition, with the exception of the addition of the term “cemento-ossifying fibroma” (COF). Another notable change in the new edition is the odontogenic cyst classification. The literature review/search reveals that the studies on the relative frequency of OTs represent mostly Americans and Africans. Very few series of studies include Asians, especially from the Indian subcontinent. This study aims to fill this lacuna and summarize the epidemiology, clinical and histopathological presentation of this heterogeneous group of lesions seen at a large teaching institute in Western India over the period of January 1981–December 2016 and compare the data with previous reports. A retrospective study was carried out with ethical clearance and permission from the authorities concerned. The pathology records from the Department of Oral Pathology and Microbiology, Government Dental teaching institute, Mumbai, India, were retrieved for all lesions of the oral cavity and jaws seen from January 1981 to December 2016. A total of 250 lesions were classified as intraosseous/extraosseous OTs during this period. All case details were reviewed with respect to age, gender, and site of tumor – they latter were divided as maxillary anterior (up to canine) and posterior (premolar and molar area including tuberosity) and mandibular anterior and posterior (premolar and molar including ramus). The histopathologic typing was also recorded. The retrieved slides were then reviewed and reclassified in accordance with the 2017 WHO classification of OTs. The annual frequency was 7.14% (250 OTs) with relative frequency of 0.0051% of all oral samples encountered between January 1981 and December 2016, that is, in 35 years. Of the 250 OTs, 248 (99.2%) cases were benign and 2 (0.8%) were malignant [Table 1]. Of the latter, there was one case each of AC and ameloblastic fibrosarcoma/odontogenic sarcoma (AFS/OS). Among these, 145 were in males and 103 were in females (male: female ratio 1.4:1), and record of gender was not available in two cases. As shown in [Table 2] and [Table 3], OTs in this study population affected patients over a wide age range of 5–98 years. Age distribution showed a peak occurrence in the second and third decades; 85% of the cases occur between the second and fifth decades [Table 4]. In all, 152 tumors were present in the mandible and 66 in the maxilla, with an overall mandible: maxilla ratio of 2.3:1. In 32 cases, record of site was not mentioned. The most frequent histological type was conventional AML (n = 77, 30.8%), followed by odontoma (OD) (n = 48, 19.2%), unicystic ameloloblastoma(UA) (n = 46, 18.4%), adenomatoid odontogenic tumor (AOT) (n = 35, 14%), cementifying fibroma(CF) (n = 15, 6%), odontogenic myxoma (OM) and cementoblastoma (CBM) (n = 6, 2.4% each), calcifying epithelial odontogenic tumor (CEOT) and odontogenic fibroma (OF) (n = 5, 2% each), ameloblastic fibroma (AF) (n = 3, 1.2%), and squamous odontogenic tumor (SOT), dentinogenic ghost cell tumor (DGCT), peripheral ameloblastoma (PA), AC, and ameloblastic fibrosarcoma (OS) (n = 1, 0.4% each) [Figure 1]a, [Figure 1]b, [Figure 1]c, [Figure 1]d. In general, tumors showed a predilection for the mandible and the posterior regions of the jaws. Gender analysis showed a female predilection for most of the tumors except AML, unicystic ameloblastoma (UA), and OD. AML, the most common tumor in this study, showed (n = 77, 30.8%) cases occurring in the 1st to 10th decades with peak incidence in 3rd to 5th decades. The mean age was 35.72 years. The male-to-female ratio was 2.66:1. Posterior mandible was commonly affected when compared to maxilla, and the ratio was 11:1. OD (n = 48, 19.2%) and UA (n = 46, 18.4%) were second most common tumors. The commonly affected age group was second to fourth decades. Peak incidence was seen in second and third decades for OD and UA, respectively. The mean age for UA was 33.87 years and for OD was 26.42 years. The male-to-female ratio for UA was 1.3:1, whereas in OD, it was 1.04:1 (in one case, gender was not available) which means males and females were almost equally involved. The maxilla-to-mandible ratio was 1:10 and 1:1.2 for UA and OD, respectively. AOT was the third most common in the present series. The commonly affected age group was second to fourth decades with peak incidence seen in second decade. The mean age was 18.89 years. The male-to-female ratio for AOT was 0.8:1. The maxilla-to-mandible ratio was 1.3:1. In this study, 15 (6%) cases of cementifying/COF were reported. In COF, age range was 20–39 years, with the peak incidence in second and third decades. The mean age was 23.76 years. Males and females were almost equally affected with a ratio of 0.8:1. Maxilla and mandible were equally involved with a ratio of 1.25:1. Six cases (2.4%) each of OM and CBM were reported. In OM, male-to-female ratio was 0.5:1, whereas in CBM all cases occurred in male only; in one case, gender was not known. OM was observed in second and third decades with peak in third decade. Age range for CMB was from 21 to 50 years. In OM and CBM, mandible was commonly affected with maxilla-to-mandible ratio of 0.5:1 and 0.2:1, respectively. Four cases each of CEOT and OF (1.6%) were recorded. CEOT showed male predilection (3:1). It occurred in second to third decades with equal predilection for posterior maxilla and mandible. OF was noted in first and third decades with female predilection (3:1). Posterior mandible was the most commonly affected site. The lower numbers of other benign OTs such as AF (n = 3, 1.2%), SOT, DGCT, PA, AC, and OS (n = 1, 0.4%) were too negligible to draw any meaningful observation. This study describes a series of OTs from the Oral Pathology Department, Government Dental teaching institute, Mumbai, India, which is the major referral center in the region for all types of dental treatment. The samples in this study are the largest yet analyzed in Maharashtra. A similar study had been carried out earlier in 2011 from the same institute, with a smaller sample size. The majority of articles that have been published after 2005 have used the 2005 WHO classification.,,,,,,,,,,,,,,,,,,, Servato et al. showed that the average proportion of OTs among oral and maxillofacial lesions evaluated by histopathology increased from 3% (±2.9%) in studies that used the 1992 WHO classification to 4% (±1.3%) in those with the later classification. This is in concordance with this study, where the relative frequency of OTs is 7.14% compared to 5.78% in the study done by Varkhede et al. Similarly, odontogenic cysts  have been reviewed where 146 OKCs were reported. If we consider OKCs in OTs as KCOTs, then prevalence will increase from 7.14% to 11.4%. It indicates that prevalence of OTs varies depending on the version of classification followed. This incidence is higher than the existing frequency in other studies from India: Deepthi et al. (4.29%), Nalabolu GR et al. (2.17%) but it was corresponding with the findings of Varkhede et al. (5.78%) and Pandiar D et al.(6.08%). In India, there is variation in frequency rates of OTs most likely due to inherent regional disparities. Also, there seems to be significant geographical variation in the frequency of OTs, with lower rates in Europe  (0.84%), North America, (1.2%) and South America (1.29%, 4.1%), and higher rate in Africa  (9.3%) [Table 5]. The literature search of OTs indicates that large published series on OTs in Indian populations is limited to a few reports.,,,,,,,, Literature search also revealed no other published series from other southern Asian countries, such as Afghanistan, Bangladesh, Bhutan, Nepal, and Pakistan, except for a few reports from Sri Lanka., However, data on OTs were available for both western and northern China as well as Japan in the eastern Asian region., [Table 5]. In this study, 99.2% and 0.8% of tumors were benign and malignant, respectively, which is in accordance with most other reports.,,,,,, Among these tumors, benign epithelial tumors were the most commonly encountered which is in concordance with previous reports from Africa,,, Ladan and Nigeria, Hong Kong, Turkey, and China., Interestingly, this is in contrast to reports from the United States, Mexico, Chile, Germany, and Canada, where epithelial and mesenchymal tumors have been reported as the most commonly encountered OTs. In this study, OTs were most frequent in the second to fifth decades of life. The mean age of OTs was 31.56 years, with peak occurrence in the third decade, similar to other studies from India, China,, and Africa. However, studies from Chile  and Brazil  have shown the mean age to be less than a decade as compared to the above findings. This may be due to racial variation or inclusion of OD s in their study. Overall, a slight male predilection (male:female = 1.4:1) of OTs was noticed in this study. This is in concordance with studies from China,, Australia, and another study from India., Most of the previous studies recorded an equal gender distribution of OTs, but a female predilection was reported by Regezi et al. and Wu and Chan ; male predilection was reported by Odukoya. This possibly discloses a gender difference among different populations. The mandible was the most common jaw affected with maxilla-to-mandible ratio of 1:2.3, which is similar to other studies from Asia , and Africa. However, studies from the American continent ,, have shown an almost equal predilection for both the jaws. This might be due to the lower frequency of AML in that population. AML with marked predilection for the mandible is the most frequent tumor (30.8%) in this study. This is similar to other studies reported from various geographical regions of India,,,,,, Africa, Turkey, Hong Kong, and China, but in contrast to those reported from Canada, Chile, Germany, the United States, and Mexico, where OD is reported as the most common OT. This also reinforces that AMLs are more common in Asians and Africans compared with Caucasians. Although these observations indicate that the distribution of OTs shows distinct difference in their frequency, there is also a view that underreporting of OD s in developing countries or the nature of institutional setup (medical college versus dental college) could be the reason for the differences in the frequency of OTs, especially AML and OD. Apart from this, the lower prevalence of OD in the Asian and African population may be due to a variety of the following reasons. These are lack of routine dental care, as these tumors remain unnoticed for years; most ODs are discovered on routine radiograph and do not produce clinical symptoms; over- or underreporting that has a direct influence on this phenomenon. Moreover, after surgical removal these tumors might not have been sent for histopathological examination. Similarly, these reported variations are also seen in the Indian population. AMLs were located in the mandible (89%), with a very high mandible-to-maxilla ratio (11:1). This is very high compared with the ratios reported by earlier studies. Reichart et al. in an extensive review of all cases reported in the literature found the ratio to be around 5.4:1. The high occurrence in the mandible in the present institutional study may be due to the referral of maxillary AMLs to otorhinolaryngologist. In this study, AMLs were frequently encountered in the molar-ramus region in the mandible and the molar region in the maxilla. Specifically with regard to AML, the mean age of occurrence does show significant variation across countries. Reichart et al. in their extensive review of 3,677 cases of AML reported the average age at initial diagnosis in industrialized countries to be 39.1 years compared with 27.7 years from developing countries. In this study, the mean age of occurrence for AML (35.76 years) was closer to that reported by Reichart et al. for developed countries, showing that there might be other factors involved. ODs occurred in the present series with a relative frequency of 19.2% and this is in concordance with Brazilian series conducted by Avelar et al. (22.1%), da-Costa et al. (18.4%), Osterne et al. (19.4%), and Ostern et al. (22.6%). OD is the second most common OT, although the frequencies differ meaningfully between studies. Fregnani et al. argue that differences in results are due to data sources, rather than geography. Medical hospitals underestimate OD frequencies and overestimate the rates of tumors that require extensive surgical procedures. Moreover, in several developing countries, ODs are occasionally not registered or sent for histological confirmation. They showed equal distribution in males and females (1.04:1) and occurred mostly in younger individuals (mean = 26.45). The tendency to occur more in the anterior maxillary region (43.9%) and posterior mandible (36.58%) was seen in both jaws. Most ODs are symptomless and discovered on routine radiographs. UA was the third most common tumor (18.4%) in our study. It showed a slight male preponderance with a ratio of 1.3:1, mean age was 33.47 years, and posterior mandible was commonly affected with a ratio of 10:1. These findings are in concordance with studies done by Philipsen and Reichart  and Li et al.. However, this is in contrast to the observations done by Gill et al., Ackerman et al., and Ledesma-Montes et al. In a study of 163 cases of AML from Latin-America, solid AML has a higher mean age of occurrence (41.4 years) than UA (26.3 years). Not a single case of solid AML was found in patients younger than 20 years in their series. In our study, we reported 9 (11.68%) cases of solid AML in the first and second decades. Adenomaoid odontogenic tumor (AOT) is reported in this study with a frequency of 16%. It is the fourth most common tumor which is in contrast to other studies from India , and Sri Lanka, where it was the second most common tumor. The female predilection of AOT was also reported by earlier reports.,,, The second decade involvement (66.66%) noted in this study is similar to other series.,,, Almost all AOTs showed predilection for the maxilla and anterior regions of the jaws, unlike other OTs. Compared with AMLs, AOTs occur at a significantly lower age. Based on the fact that AOT being a well-encapsulated tumor expands centrifugally, that is, equally in all directions, Sriram and Shetty  hypothesize that AOT may cause expansion of the cortical plates at an early stage compared to AMLs, which spread linearly within the cancellous bone before causing expansion/resorption of the cortical plates. Furthermore, AOTs occur more frequently in the anterior region, which might alert the individual to seek attention at an earlier stage. In this study, 15 (6%) cases of cementifying/COF were reported. In COF, second to fourth decades were commonly involved with peak incidence in the second and third decades and a mean age was 23.76 years. Males and females were almost equally affected, with a ratio of 0.8:1. Maxilla and mandible were equally involved with a ratio of 1.25:1. This is in contrast to the study by Eversole et al. The difference can be attributed to the fewer number of samples in this study. There were no major changes for mesenchymal OTs in the fourth edition, with the exception of the addition of the term “cemento-ossifying fibroma (COF).” In fact, ossifying fibroma is used to describe a benign bone-producing fibrous neoplasm of the skeleton, which is divided into two main clinicopathologic entities: COF and juvenile ossifying fibroma. In the 2017 classification, COF is the preferred term because of its descriptive value, and more importantly, it is classified under OTs to distinguish it from the juvenile types. However, it is still a fibro-osseous lesion and discussed in detail with the other ossifying fibromas in the fibro-osseous lesions section of the last WHO edition. The comparison of various studies revealed wide variations in the occurrence of the less frequent tumors, such as OM and CBM (n = 6, 2.4% each). Rare neoplasms account for 0.83% in this study which is too negligible to draw any meaningful conclusion. The frequency of these neoplasms in other series was also low, reinforcing the rarity of these tumors. Of the total OTs in this study, malignant OTs represented one case each of AC and ameloblastic fibrosarcoma/OS (n = 1, 0.4%), 0.8%. This relative frequency is similar to other reports from the Western Hemisphere that ranged from 0% to 1.1%,,, but in contrast to the significantly higher rates from Africa  and China, that is in the range of 5.8%–5.9%. In conclusion, we observed a marked geographic variation in the relative incidence of various OTs, particularly notable in AMLs and ODs. The incidence observed in this study is similar to previous studies from Africa and Asia and in contrast to those reported from American and European countries. Among the Indian population, Maharashtrian (cosmopolitan and Marathwada) and Andhra (Telugu) regions showed more cases of KCOT, whereas in Gujarati and Kerala (Malayalam) population, AML was more common. Following the WHO 2017 classification, it is concluded that AML is the most common neoplasm. If the 2005 WHO classification was used, KCOT would be the most common neoplasm. These findings suggest that the incidence of common OTs may vary according to the version of classification used and also stresses the influence of genetic and/or environmental (epigenetic) factors. Further studies are required for better understanding of these neoplasms. Regezi JA, Sciubba J. Oral Pathology. Clinical-pathologic Correlations. Philadelphia: WB Saunders; 1993. p. 362-97. Sriram G, Shetty RP. Odontogenic tumors: A study of 250 cases in an Indian teaching hospital. Oral Surg Oral Med Oral Pathol Oral Radiol Endod 2008;105:e14-21. Pindborg J, Kramer I, Torloni H. Histological Typing of Odontogenic Tumors, Jaw Cysts, and Allied Lesions. Geneva, Switzerland: World Health Organization; 1971. Kramer I, Pindborg J, Shear M. Histological Typing of Odontogenic Tumors, WHO 2nd ed. Berlin: Springer-Verlag; 1992. p. 7-8. Barnes L, Everson J, Reichart P, Sidransky D. World Health Organization Classification of Tumors. Pathology and Genetics of Head and Neck Tumors. Lyon: IARC press; 2005. p. 285. Gaitan-Cepeda LA, Quezada-Rivera D, Tenorio-Rocha F, Leyva-Huerta ER. Reclassification of odontogenic keratocyst as tumour. Impact on the odontogenic tumours prevalence. Oral Dis 2010;16:185-7. Wright JM, Vered M. Update from the 4th Edition of the World Health Organization Classification of Head and Neck Tumours: Odontogenic and maxillofacial bone tumors. Head Neck Pathol 2017;11:68-77. Soluk-Tekkeşin M, Wright JM. The World Health Organization Classification of Odontogenic Lesions: A Summary of the Changes of the 2017 (4th) Edition. Turk Patoloji Derg 2018;34. Varkhede A, Tupkari JV, Sardar M. Odontogenic tumors: A study of 120 cases in an Indian teaching hospital. Med Oral Patol Oral Cir Bucal 2011;16:e895-9. Buchner A, Merrel PW, Carpenter WM. Relative frequency of central odontogenic tumors: A study of 1,088 cases from northern California and comparisons to studies from others parts of the world. J Oral Maxillofac Surg 2006;64:1343-52. Olgac V, Koseoglu BG, Aksakalli N. Odontogenic tumors in Istanbul: 527 cases. Br J Oral Maxillofac Surg 2006;44:386-8. Okada H, Yamamoto H, Tilakararatne WM. Odontogenic tumors in Sri Lanka: Analysis of 226 cases. J Oral Maxillofacial Surg 2007;65:875-82. Gupta B, Ponniah I. The pattern of odontogenic tumors in a government teaching hospital in southern Indian state of Tamil Nadu. Oral Surg Oral Med Oral Pathol Radiol Endod 2010;110:32-9. Jing W, Xuan M, Lin Y, Wu L, Lui L, Zheng X, et al. Odontogenic tumors: A retrospective study of 1642 cases in a Chinese population. Int Oral Maxillofac Surg 2007;36:20-5. Avelar RL, Antunes AA, Santos Tde S, Andrade ES, Dourado E. Odontogenic tumors: Clinical and pathology study of 238 cases. Braz J Otorhinolaryngol 2008;74:668-73. Luo HY, Li TJ. Odontogenic tumors: A study of 1309 cases in a Chinese population. Oral Oncol 2009;45:706-11. Tawfik MA, Zyada MM. Odontogenic tumors in Dakahlia, Egypt: Analysis of 82 cases. Oral Surg Oral Med Oral Pathol Radiol Endod 2010;109:67-73. Deepthi PV, Beena VT, Padmakumar DK, Rajeev R, Sivakumar R. A study of 1177 odontogenic lesions in a South Kerala population. J Oral Maxillofac Pathol 2016;20:202-7. Osterne RL, Brito RG, Alves AP, Cavalcante RB, Sousa FB. Odontogenic tumors: A 5-year retrospective study in a Brazilian population and analysis of 3406 cases reported in the literature. Oral Surg Oral Med Oral Pathol Oral Radiol Endod 2011;111:474-81.
da-Costa DO, Maurício AS, de-Faria PA, da-Silva LE, Mosqueda-Taylor A, Lourenço SD. 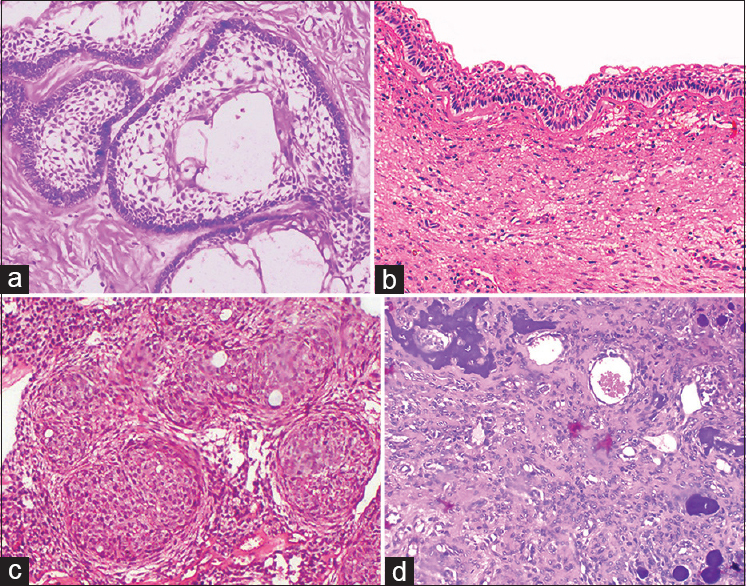 Odontogenic tumors: A retrospective study of four Brazilian diagnostic pathology centers. Med Oral Patol Oral Cir Bucal 2012;17:e389-94. Siriwardena BS, Tennakoon TM, Tilakaratne WM. Relative frequency of odontogenic tumors in Sri Lanka: Analysis of 1677 cases. Pathol Res Pract 2012;208:225-30. Servato JP, Prieto-Oliveira P, de Faria PR, Loyola AM, Cardoso SV. Odontogenic tumours: 240 cases diagnosed over 31 years at a Brazilian university and a review of international literature. Int J Oral Maxillofac Surg 2013;42:288-93. Sekerci AE, Nazlim S, Etoz M, Deniz K, Yasa Y. Odontogenic tumors: A collaborative study of 218 cases diagnosed over 12 years and comprehensive review of the literature. Med Oral Patol Oral Cir Bucal 2015;20:e34-44. Mullapudi SV, Putcha UK, Boindala S. Odontogenic tumours and giant cell lesions of jaws – A nine year study. World J Surg Oncol 2011;9:68-75. Gill S, Chawda J, Jani D. Odontogenic tumours in Western India (Gujarat): Analysis of 209 cases. J Clin Exp Dent 2011;3:e78-83. Bhagwat A, Barpande SR, Bhavthankar JD, Mandale MS, Humbe J, Singh P. Odontogenic tumors: Review of 127 cases in Marathwada region of Maharashtra. J Oral Maxillofac Pathol 2017;21:457-8. Joy TC, Bafna S, Tupkari JV, Ahire M. Cysts of the orofacial region: A 35 year demographic data at an Indian dental institute. Int J Adv Res 2017;5:24-41. Nalabolu GR, Mohiddin A, Hiremath SK, Manyam R, Bharath TS, Raju PR. Epidemiological study of odontogenic tumours: An institutional experience. J Infect Public Health 2016;10:324-30. Pandiar D, Shameena PM, Sudha S, Varma S, Manjusha P, Banyal VS, et al. Odontogenic tumors: A 13-year retrospective study of 395 cases in a South Indian teaching institute of Kerala. Oral and Maxillofac Pathol J 2015;6:602-8. Mosqueda-Taylor A, Ledesma-Montes C, Caballero-Sandoval S, Portilla-Robertson J, Ruíz-Godoy Rivera LM, Meneses-García A. Odontogenic tumors in Mexico: A collaborative retrospective study of 349 cases. Oral Surg Oral Med Oral Pathol Oral Radiol Endod 1997;84:672-5. Lima-Verde-Osterne R, Turatti E, Cordeiro-Teixeira R, Barroso-Cavalcante R. The relative frequency of odontogenic tumors: A study of 376 cases in a Brazilian population. Med Oral Patol Oral Cir Bucal 2017;22:e193-200. Ladeinde AL, Ajayi OF, Ogunlewe MO, Adeyemo WL, Arotiba GT, Bamgbose BO, et al. Odontogenic tumors: A review of 319 cases in a Nigerian teaching hospital. Oral Surg Oral Med Oral Pathol Oral Radiol Endod 2005;99:191-5. Odukoya O. Odontogenic tumors: Analysis of 289 Nigerian cases. J Oral Pathol Med 1995;24:454-7. Daley TD, Wysocki GP, Pringle GA. Relative incidence of odontogenic tumors and oral and jaw cysts in a Canadian population. Oral Surg Oral Med Oral Pathol 1994;77:276-80. Lawal AO, Adisa AO, Olusanya AA. Odontogenic tumours: A review of 266 cases. J Clin Exp Dent 2013;5:e13-17. Arothiba JT, Ogunbiyi JO, Obiechina AE. Odontogenic tumors: A 15 year review from Iadan, Nigeria. Br J Oral Maxillofac Surg 1997;35:363-7. Wu PC, Chan KW. A survey of tumors of the jawbones in Hong Kong Chinese: 1963-82. Br J Oral Maxillofac Surg 1985;23:92-102. Gunhan O, Erseven G, Ruacan S, Celasun B, Aydintng Y, Ergun E, et al. Odontogenic Tumors. A series of 409 cases. Aust Dent J 1990;35:518-22. Lu Y, Xuan M, Takata T, Wang C, He Z, Zhou Z, et al. Odontogenic tumors. A demographic study of 759 cases in a Chinese population. Oral Surg Oral Med Oral Pathol Oral Radiol Endod 1998;86:707-14. Regezi JA, Kerr DA, Courtney RM. Odontogenic tumors: Analysis of 706 cases. J Oral Surg 1978;36:771-8. Ochsenius G, Ortega A, Godoy L, Peñafiel C, Escobar E. Odontogenic tumors in Chile: A study of 362 cases. J Oral Pathol Med 2002;31:415-20. Larsson A, Almerén H. Ameloblastoma of the jaws. An analysis of a consecutive series of all cases reported to the Swedish Cancer Registry during 1958--1971. Acta Pathol Microbiol Scand A 1978;86A: 337-49. Fernandes AM, Duarte EC, Pimenta FJ, Souza LN, Santos VR, Mesquita RA, et al. Odontogenic tumors: A study of 340 cases in a Brazilian population. J Oral Pathol Med 2005;34:583-7. Johnson NR, Savage NW, Kazoullis S, Batstone MD. A prospective epidemiological study for odontogenic and non-odontogenic lesions of the maxilla and mandible in Queensland. Oral Surg Oral Med Oral Pathol Oral Radiol 2013;115:515-22. Reichart PA, Philipsen HP, Sonner S. Ameloblastoma: Biological profile of 3677 cases. Eur J Cancer B Oral Oncol 1995;31B:86-99. Fregnani ER, Fillipi RZ, Oliveira CR, Vargas PA, Almeida OP. Odontomas and ameloblastomas: Variable prevalences around the world? Oral Oncol 2002;38:807-8. Philipsen HP, Reichart PA. Unicystic ameloblastoma. A review of 193 cases from the literature. Oral Oncol 1998;34:317-25. Li T-J, Wu Y-T, Yu S-F, Yu G-Y. Unicystic ameloblastoma. A clinicopathologic study of 33 Chinese patients. Am J Surg Pathol 2000;10:1385-92. Ackermann GL, Altini M, Shear M. The unicystic ameloblastoma: A clinicopathological study of 57 cases. J Oral Pathol 1988;17:541-6. Ledesma-Montes C, Mosqueda-Taylor A, Carlos-Bregni R, de León ER, Palma-Guzmán JM, Páez-Valencia C, et al. Ameloblastomas: A regional Latin-American multicentric study. Oral Dis 2007;13:303-7. Eversole LR, Leider AS, Nelson K. Ossifying fibroma: A clinicopathologic study of sixty-four cases. Oral Surg Oral Med Oral Pathol 1985;60:505-11.